Make any outdoor living space your own personal oasis with the Lucca Collection. 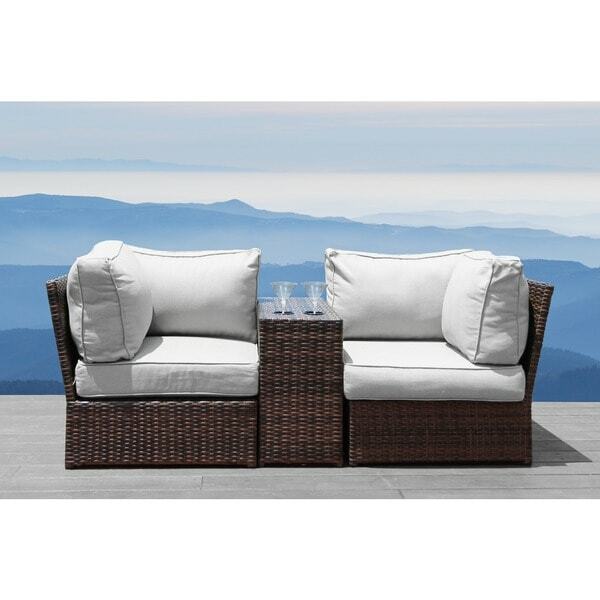 The brown wicker frame and 5-inch thick ultrasoft cushions are oversized for added comfort. The set includes a cup holder table and loveseat to provide plenty of space in your backyard or patio for entertaining. We were looking for a grouping of seating tp place in front of our fire pit. We have been very pleased with the look, comfort, perfect size of the Lucca Wicker Loveseat, and the Cup Holder Table accompanying the set is perfect to hold out sunset cocktails! With what we felt was a good price, we are very pleased with our purchase. I am very tactile so I have never ordered furniture online without first touching and seeing it in person - this was a first for me... and I was looking for something that was different than what everyone else has and this fit the bill - love the idea of cup holders!!! They are on the small side so won't hold a mug or coffee cup, FYI. I ordered the dark color because I liked the lighter contrast of the pillows -- but the color is not cream-off-white, but more of a beige-grey - which is fine with me, but I was taken aback a bit. They are super comfy! I chose NOT to attach the middle piece so I could move them around a bit, and they still work just great. Great price for all three pieces. The photo of these just does this set no justice! I was so surprised of the quality, comfort, and look for the price. It shipped quickly and assembled easily, as the pieces came already assembled and all we had to do was clip the pieces together. Great buy! I love sectional, but the cushions or too soft and not memory foam. After two weeks they were indentations that would not go away. big cushions, with a cup holder? Can't go wrong!